Norman Osborn took time out of his very busy schedule to pay a visit to Hera Panhellenios, president of the Olympus Group company and Greek God. The Emir of Dubai told Osborn that Hera could offer a very compelling business proposition. Norman listened to Hera's proposition, which she called Continuum, and after hearing it he immediately ordered that H.A.M.M.E.R. coordinate its rollout. It appeared as though Continuum was some universe-altering plot conceived by Hera. She and Norman exchanged threats and soon after the Dark Avengers converged on Hera and Hercules (and each of their respective groups) at the Excello Soap Company, a subsidiary of the Olympus Group. 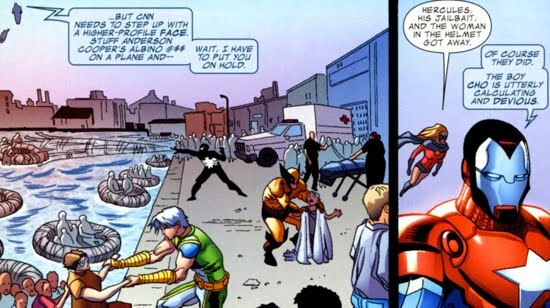 The Dark Avengers were outmatched against Hercules, Hera, and the others and during the melee, Amadeus Cho put Norman's Avengers to the test. He suggested that Hercules sink a nearby cruise liner, forcing Osborn's hand at being a do-gooder and saving the civilians. It worked! Norman called the team off of their attack in order to rescue the civilians. Ares, God of War and one of Osborn's Dark Avengers, eventually mediates a deal between Osborn and Ares' mother, Hera. Their deal involves H.A.M.M.E.R. 's consultation during Hera's rolling out of the Continuum product as long as there is no interference by Osborn's forces. Hera added that if Norman sealed this pact with her, she would even attend to his special 'supplications' (ie. answer his prayers). Osborn obliged because Ares was such an integral part of his team, he then let Hera know that he's aware of that Continuum has already begun, despite her consulting Osborn. Another uneasy truce. Norman doesn't trust Hera and Hera doesn't trust Norman, its a match made in Heaven...err Olympus. They left each other in peace, but that could have changed at any instant.